1 of 2 Heat oven to 350 degrees F. In large bowl, blend butter, coconut and crumbs. Press over bottom and up sides of 9-inch pie plate. 2 of 2 Bake crust at 350 degrees F for 14 minutes, or until lightly golden on edges. Transfer plate to wire rack; let cool. 1 of 3 In blender, combine clementine sections and lemon juice. Pulse until smooth. Bring butter, sugar, rind, citrus mixture and gelatin to a simmer in a medium-size saucepan. 2 of 3 In bowl, slightly whisk eggs to break up. Whisk a little of hot clementine mixture into eggs; then whisk egg mixture back into saucepan. Cook 2 minutes, stirring constantly, until mixture is thickened and registers at least 160 degrees F on an instant-read thermometer. Strain into a large bowl. Place plastic wrap directly on surface of mixture; let cool at room temperature for 30 minutes. Refrigerate for 2 hours, until mixture begins to set. 3 of 3 Add cream to citrus mixture. Beat with an electric mixer to very soft peaks, about 3 minutes. Spoon into crust. Chill until firm, about 1 to 2 hours. 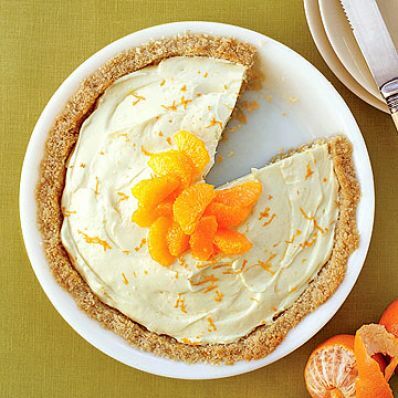 Top with clementine sections, if desired.